Eggplant is a member of the nightshade or potato family, which also includes tomatoes and hot peppers. Many useful medicines are derived from this family. 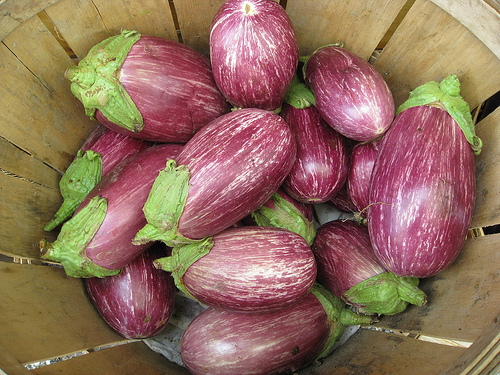 Eggplants can be purple, green, white or striped, pear-shaped or cylindrical and the size of a golf ball to a football. They are often used as a meat substitute. Eggplant is fat free, cholesterol free, sodium free, low in calories, and a good source of dietary fiber. Eggplant, or aubergine as it is called in France, is a vegetable long prized for its beauty as well as its unique taste and texture. Eggplants belong to the plant family of Solanaceae, also commonly known as nightshades, and are kin to the tomato, bell pepper and potato. Eggplants grow in a manner much like tomatoes, hanging from the vines of a plant that grows several feet in height. While the different varieties do vary slightly in taste and texture, one can generally describe the eggplant as having a pleasantly bitter taste and spongy texture. In many recipes, eggplant fulfills the role of being a complementary ingredient that balances the surrounding flavors of the other more pronounced ingredients. Eggplants do not store well for long periods of time. Without refrigeration, eggplants can be stored in a cool, dry place for 1 or 2 days. If you don’t intend to eat the eggplant within 2 days, it should be refrigerated. To refrigerate, wrap in a paper towel and place in a reusable container or perforated plastic bag in the crisper section of your refrigerator for use within 5 - 7 days. Eggplant may also be blanched or steamed then frozen for up to six months. Eggplants are sensitive to the ethylene gas given off by some fruits and vegetables, such as apples and potatoes, so do not store them with each other. Be careful when handling because they bruise easily. Although they look hardy, eggplants are actually very perishable and care should be taken in their storage. Eggplants are sensitive to both heat and cold and should ideally be stored at around 50 degrees Fahrenheit (10 degrees Celsius). Do not cut eggplant before you store it as it perishes quickly once its skin has been punctured or its inner flesh exposed. The entire eggplant can be eaten. However, the skin sometimes has a bitter taste, so many people prefer to peel the skin off. Clean the eggplant by running under cold running water and wiping dry with a paper towel or wipe off with a damp paper towel. Trim the stem off from the eggplant. Eggplants absorb liquids very easily. To reduce the amount of moisture an eggplant will absorb during cooking, a common preparation method includes “salting” or “purging” the eggplant. To salt the eggplant, slice into pieces, wash under cold water, lay the pieces on a rack or paper towels, and then rub the vegetable with salt. Let the salt set for ½ hour to an hour. Once the slices have sat for the appropriate time, wipe the salt from the slices with a paper towel. (Do not rinse off with water because that will cause the eggplant to absorb moisture back into it.) After wiping the salt off, firmly squeeze the slices between the palms of your hands to get the excess moisture out of them, then pat dry with a paper towel. Slices are ready to cook. Eggplants are delicious hot or cold and can be enjoyed marinated, stuffed, roasted, grilled, fried, in a casserole, in stews, or on brochettes. To tenderize the flesh's texture and reduce some of its naturally occurring bitter taste, you can sweat the eggplant by salting it. After cutting the eggplant into the desired size and shape, sprinkle it with salt and allow it to rest for about 30 minutes. This process will pull out some of its water content and make it less permeable to absorbing any oil used in cooking. Rinsing the eggplant after "sweating" will remove most of the salt. Eggplant can be baked, roasted in the oven, or steamed. If baking it whole, pierce the eggplant several times with a fork to make small holes for the steam to escape. Bake at 350 degrees Fahrenheit (about 177 degrees Celsius) for 15 to 25 minutes, depending upon size. You can test for its readiness by gently inserting a knife or fork to see if it passes through easily. Use it as a dip for vegetables or as a sandwich filling. Mix cubed baked eggplant with grilled peppers, lentils, onions and garlic and top with balsamic vinaigrette. Stuff miniature Japanese eggplants with a mixture of feta cheese, pine nuts and roasted peppers. Add eggplant to your next Indian curry stir-fry. The following nutrition information is for 1/5 of an eggplant (84 grams). Eggplant is a very good source of dietary fiber, vitamin B1, and copper. It is a good source of manganese, vitamin B6, niacin, potassium, folate, and vitamin K. Eggplant also contains phytonutrients such as nasunin and chlorogenic acid. Eggplant also contains phytonutrients such as nasunin and chlorogenic acid.